Jalpaiguri Welfare Organization has been working for the well-being women & children since its inception. Besides restoring the lost child to his/her parents, helping the guardians to trace out the whereabouts of their lost children Jalpaiguri Welfare Organization always did advocacy on education, health & safe environment for all children. At the time when there was no shelter home for distressed children, the organization stood by them and provided shelter & care. The administration recognized our efforts and they too referred children in need to our organization as they believed in our dedication towards children. 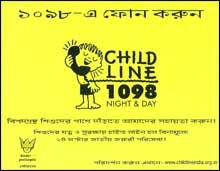 Later on Jalpaiguri Welfare Organization became a stakeholder in child protection mechanism and started the CHILDLINE service during March 2003. First started in 1996 in Mumbai today CHILDLINE is serving the children of more than 256 cities throughout the country. 1098 a 24- hour free phone outreach service for children up to 18 years. JALPAIGURI WELFARE ORGANIZATION is providing this service in collaboration with the Ministry of Women & Child Development, Govt. of India and CHILDLINE India Foundation, Mumbai. Our target groups are: Street Children, Child labour, abandoned children, Child victims of HIV/AIDS, Child addicts, lost child, Runaway child, Emotionally disturbed child, Child affected by the Natural Disasters, Child as Political Refugees, Differently abled child. The list is not exhaustive one. The supports we extend to our little citizen as per need are: : Medical, Shelter, Restoration, Sponsorship, Emotional Support & Guidance etc..